In tough economic times, it’s common to hear worries about the survival of the arts. And it’s true, that sector of society is affected, like every other. But it’s also true that art is everywhere, if you look. 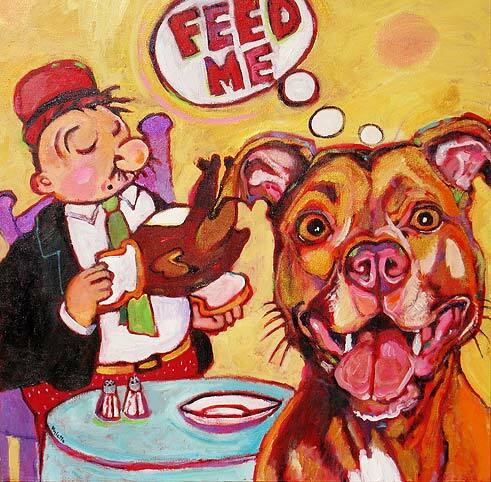 For example, the whimsical dog paintings of Sonoma County artist Mylette Welch are on display in the storefront windows of the vacant space once occupied by Sawyer News, on Fourth Street in downtown Santa Rosa. And for another example, a reader reports seeing, on her daily commute to work, inventive scrap metal sculptures outside the Muffler Works on McDowell Boulevard in Petaluma. What random acts of artwork have you noticed in your normal daily travels? Send me your notes, and photos if you like, at dan.taylor@pressdemocrat. com. For more on Mylette Welch and her work: http://www.mylettewelch.com.